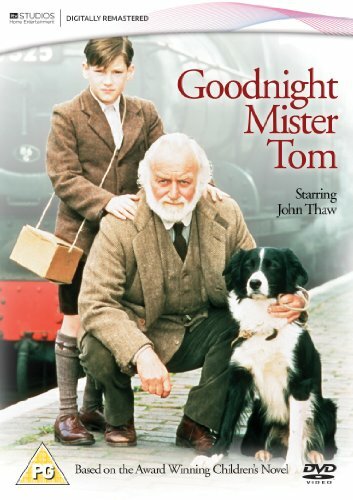 The TV production Goodnight, Mr Tom is based on Michelle Magorian’s successful eponymous novel. It illustrates the story of the children who were evacuated from London during WWII telling one boy’s heartbreaking tale. Although quite accurate when it comes to WWII, it’s a family movie. Shortly before Dunkirk a group of young boys and girls is evacuated to a picturesque British village. Some of the villagers are happy to take care for a child, others, like Mister Tom, have to be forced. Mr Tom is an old grumpy widower who never got over the death of his wife and young son during WWI. He keeps to himself and hardly speaks to people. At first he really isn’t thrilled to have a young child stay with him but after a few days he starts to like the boy. The kid is very shy and quiet and wets his bed nightly. Mister Tom takes this catastrophe surprisingly lightly and doesn’t even use the belt the boys’ mother has sent him hoping he wpuld use it. It seems as if the mother, a zealously religious woman, regularly punished the boy. It’s one of those stories in which an old, lonely person and an abused child become friends and take care of each other. The boy starts to put on weight, becomes more lively and enjoys life again until the day when his mother who still lives in London, sends for him. When the boy doesn’t stay in touch, Mister Tom gets alarmed and undertakes a trip to London. In the village, while they had their air raid shelters which they had built themselves in the garden, they were rarely if ever bombed. Most planes just flew by on their way to London. London however is constantly bombed and in the mess and the chaos Mr Tom has a hard time to find the boy’s house. The rest of the story is quite dramatic and says a lot about how children were treated in those times. Not only by their parents but also by the authorities. It’s quite a nice story but more than that the movie captures the life of the civilians during WWII quite well. It must have been quite an adventure for all these city kids to be sent to the country. For a while it must have felt like holidays. Surely, they were homesick but compared to their life in the city, they had a lot of freedom. It was quite tragic too. Many a child lost his parents while it stayed somewhere else. I couldn’t find a trailer but attached part I of the movie. The whole movie can be watched on YouTube. This part contains an interesting intro that gives some background information. This entry was posted in Children and War, History, Movie, Reviews, War Movie, WWII and tagged Brtish TV Production, Children and War, Children in War Movies, Goodnight Mr. Tom, History, Movies, Reviews, War Movie, WWII. Sounds interesting. How does it compare to Hope and Glory? I’m glad to hear its on You Tube. Were people forced to take in kids? Seems like it would have been voluntary. Hope and Glory is better, I think but it’s a nice movie nevertheless. I think that when there were too many kids they had to force a few people to take them but I’m not sure. I didn’t even chekc whether it was based on a true story. Yes, it’s on YouTube. I loved the movie Hope and Glory. I need to watch that again. I think it might even be one of my Top 20. I really liked it a lot. My parents were both evacuated, and the people who took them in volunteered. My mother, in particular, really suffered from her placements and she was used as an unpaid servant while those who ‘cared’ for her and a sibling also exploited their rations. I’m sure there were better stories out there. Thanks for sharing this, Guy and I’m sorry to hear it. That is something this film doesn’t touch on. All the terrible things the boy experiences he experiences because of his own mother. Being away from your family would in many cases be traumatizing, I agree. It is probabaly not much different than when people adop a child. they volunteer but it is no guarantee they will treat them right. I have herad of many a story like this. Have you seen Sarah’s Key yet? I watched it last week and I enjoyed it. It deals with families and children in France during the holocaust. No I haven’t. I wanted to read the book first but if you say it is good, I’d like to watch it. I’m not sure the book is that good. The author was inspired by her mother’s experience as a nurse in WW2. Magorian did a lot of research and interviewed many evacuees also. I haven’t read it since I was a kid but from what I recall it was pretty accurate. If you’re interested in other books on WW2 for kids there’s Carrie’s War (I think there’s a series of this – i saw it when i was young so I can’t remember if it’s any good but def one for the kids) and The Lion and the Unicorn. If you’re lucky enough to be near the Imperial War Museum in London I think there’s an exhibition on WW2 and children’s literature. Thanks a lot, Curvy Kitty. I should have done my research better before posting then I wuld have know it is based ona true account. Sorry, more thoughts. People volunteered to have kids. But the notion of volunteering is pretty flexible. If a billeting officer came to your house and you had a spare room you’d find it pretty hard to say no! That’s how I thought it was. I can imagine some people were less than thrilled. I’m sure as well that Guy’s parents were no exception and that it was hard on many kids.